Vail Auguste Clape 1925-2018. Life Changing Syrah! We pay tribute to August Clape and share with you just a few bottles of his special wines. I will not even attempt to do more than quote Kermit Lynch, other than to say simply, Auguste Clape, Thankyou. Even when Auguste Clape appeared in newspapers and magazines and his reputation spread worldwide, it did not change him, it did not go to his head, and he never tooted his own horn. How I loved Auguste’s humility. He wanted to make something good, something fine, something that gave people pleasure. That’s all, and that’s a lot. His humility and honesty made tasting with him a treat. 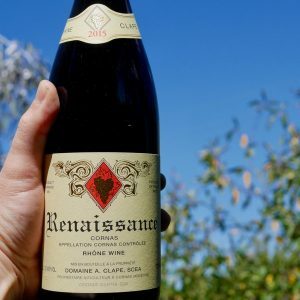 His ego never got in the way—he could be severe about one of his cuvées and so could I as we searched to define the nuances of a successful wine. 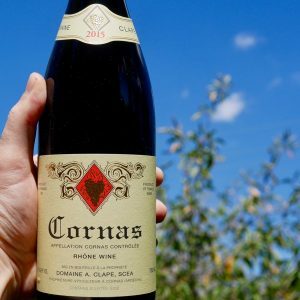 Those of you who cellared and enjoyed drinking his Cornas might also enjoy knowing that success did not alter his lifestyle. He never changed or remodeled his modest home, never judged by social status. As much as we saw each other over almost half a century, Auguste and I never wined and dined and lived it up together. Unusual. We were happy in the winery under his home, nose to glass, tasting and spitting, exploring what was in our glasses. In Vino Veritas. In Auguste Clape Veritas. The good news for fans? Both Auguste’s son and grandson have for years worked alongside him. His skills will continue to be found in bottle. In 1996 during my first week at Yarra Yering, Doc handed me a bottle of wine, with simple instructions, enjoy. It was a 1983 Auguste Clape Cornas. Wow! The sophistication and personality of the wine was insane. It just screamed DRINK ME! The beautiful texture, incredible depth of fruit, and, elegance. The complexity of the wine entranced. A Guiding Light in the Making of Yarra Yering Shiraz wines. Today in celebration of August Clape we release just 3 bottles of 2015 Cornas and 5 bottles of Renaissance.